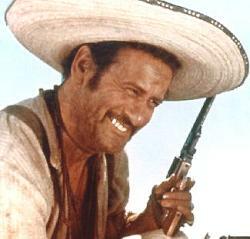 At his death in 2014, Eli Wallach was among the oldest old-time Hollywood actors who were still working. He played Tuco ("the ugly") in The Good, the Bad and the Ugly with Clint Eastwood, the train robber in the all-star How the West was Won, the leader of the bandits in The Magnificent Seven with Yul Brynner and (ambiguous link, Steve McQueen), and a heartbroken mechanic in The Misfits with Clark Gable and Marilyn Monroe. He played Don Altobello, the cunning competitor to the Corleone family in The Godfather: Part III, and he was the blind hitman in Tough Guys with Kirk Douglas and Burt Lancaster. His first film, which Wallach considered his best, was Elia Kazan's Baby Doll with Karl Malden and Carroll Baker. Wallach grew up poor and Jewish in an Italian neighborhood of Brooklyn. Appearing in a school play at 15, he knew he would be an actor. After college and Army duty, he was one of the early practitioners of method acting, studying at the Actors Studio with Marlon Brando, Patricia Neal, Montgomery Clift, and Kevin McCarthy. As a young, struggling actor, when he got a role in a road show, he sublet his apartment to Brando, who, Wallach complained years later, was often late with the rent. He made his Broadway debut in Skydrift in 1945, opposite Rita Moreno, also making her first New York appearance. The play bombed and closed within a week. Wallach won a Tony for The Rose Tattoo in 1951 with Maureen Stapleton, and an Obie Award in 1963 for The Typists and the The Tiger, costarring his wife. He won an Emmy for the UN-funded anti-drug film The Poppy Is Also a Flower in 1967. Wallach was known as a Hollywood actor, but he always lived in New York. He married Anne Jackson, an actress he met in those drama workshops, and they worked together in numerous plays and films. Wallach said that he and his wife were lucky to find scripts where their characters argued, as it kept their marriage healthy. They remained married for life, and Wallach was never arrested, never scandalized. He was paid $350 to play Mr Freeze on TV's Batman, and was astounded when he read that Arnold Schwarzenegger was paid $20 million to play the same character in the disastrous Batman & Robin. After Wallach grumbled about the injustice of it all, his wife offered sound advice: "Lift weights". After Wallach told that story on a few talk shows in 2005, promoting his autobiography, The Good, the Bad, and Me, he received an unexpected package from Gov. Schwarzenegger -- a small set of ten-pound barbells.